I wouldn't say I exactly have startitis, but I have started several new projects recently. Back in March, during the Honey Cowl craze, I cast on for one, using two colors of madelinetosh pashmina -- Betty Draper's Blues (the same color, although different yarn base, that I used for my sister's Saroyan) and Mica. I haven't gotten far on it, but I'm going to a conference soon, so I need some straightforward knitting. 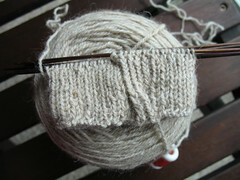 Usually, I knit socks on size 1 needles on around 66 stitches. These were 68 stitches, but the fabric on size 1s was too loose, so I frogged and switched to size 0 needles. The fabric was beautiful, but when I got almost to the heel, I tried the sock on, and although I could get it on, it was too small, and I knew the instep would be an issue. So I frogged again (although I wish I had taken a picture first -- the fabric rally was gorgeous!) and cast on for the next size up, 76 stitches. The good news is that I definitely have the cable, over 7 stitches with a twist in the middle, down pat, even without a cable needle! This will be another conference project. 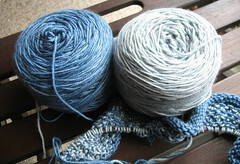 And finally -- a while back I ordered a skein of silk lace yarn all the way from Germany. It's Tussah Silk from DyeForYarn and the yarn-maker was in Fuerth, a suburb of Nuernberg (Nuremberg). Eons ago, I was an Army wife, and we lived in another Nuernberg suburb. The big PX and commissary for our region was in Fuerth, and I spent much time there. Obviously it was meant to be! I think that the darker color on the outside looks fine. I prefer a darker colors bordering lighter ones -- but that's just me! 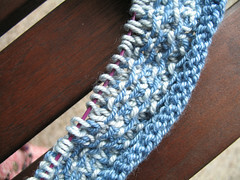 I can't actually tell about the edge color - alas, I think I would need to see more of it knitted before I could decide.